You'll be £15.99 closer to your next £10.00 credit when you purchase Confessions of a Special Agent. What's this? Many are the tales of young men lying about their age to join the Army, yet Jack Evans sought far more at the age of just possibly just seventeen – to act behind enemy lines as an agent of the Special Operations Executive. Evans had joined the RAF in 1940, despite being well under the legal age, and two years later was recruited into the SOE as a member of the Small Scale Raiding Force. 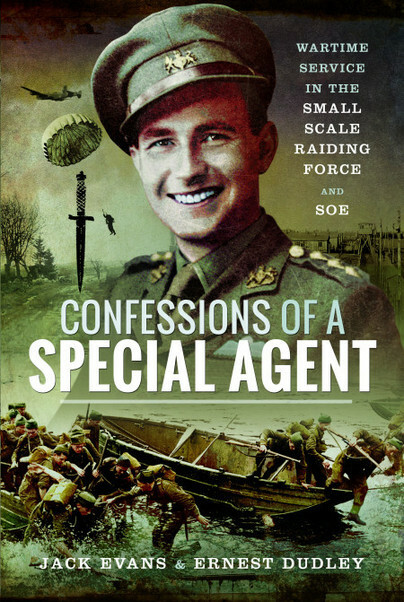 Evans related his experiences with the SOE to author Ernest Dudley in the 1950s, in which he describes his training, including learning how to jump by parachute in preparation for an operation into France – though he was withdrawn from the operation when his true age was disclosed. He then joined the SSRF, taking part in a number of raids upon Occupied France. Evans was then transferred to the Brandon Mission in Africa. This involved an eight-man team being parachuted into Tunisia to attack a railway line. In 1943 he was promoted to the rank of captain and parachuted into France, only to be captured by the Germans and imprisoned in Stalag Luft III for the remainder of the war. Evans suffered considerable mental trauma from his time behind enemy lines and his internment at the hands of the Germans and was unable to settle into normal civilian life. His astonishing story, written so soon after the end of the war, was considered in many respects to be ahead of its time. ERNEST DUDLEY in the 1950s. Based on these tape recordings, Confessions of a Special Agent was first published by Robert Hale in 1957. Born Vivian Ernest Coltman-Allen in July 1908, Dudley took his celebrated pseudonym from his place of birth, Dudley, near Wolverhampton. By time of his death in February 2006, he had produced scores of books, mainly crime fiction, but also non-fiction biographies, historical novels, children's books and a number of radio and television series.